Every year, millions of people see a health care professional for symptoms that diagnostic tests can't explain. In most of these patients, the cause of the illness is stress, particularly stress that isn't fully recognized. The symptoms are quite real and may occur anywhere in the body. This condition, called Stress Illness (or PPD which stands for Psychophysiologic Disorders) can be mild or severe and causes symptoms that may last for years. Now there is a new approach to this common problem. 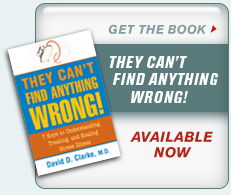 Since 1983, Dr. David Clarke has successfully cared for over 7000 patients with Stress Illness. His techniques for diagnosis and treatment are described in the book They Can’t Find Anything Wrong! Like a check-up for hidden stresses, it is written for the average reader, includes dozens of inspiring stories and is endorsed by leading medical school professors. To learn more, try the Hidden Stress Screening Test on the Book Overview page and look at the Stress Check-Up Blog.